Significant events in the life of Jesus are listed here, with places where these events are commemorated. The Church of All Nations, standing near the foot of the Mount of Olives in Jerusalem, is built over the rock on which Jesus is believed to have prayed in agony the night before he was crucified. The church and the adjacent Garden of Gethsemane, with its eight ancient olive trees, provide an evocative place for meditation, especially when visited at night. The church is also known as the Basilica of the Agony. Completed in 1924, it is the third church on the site. Its design blends the façade of a typically Roman basilica with a roof of 12 small domes that suggest an Eastern character. 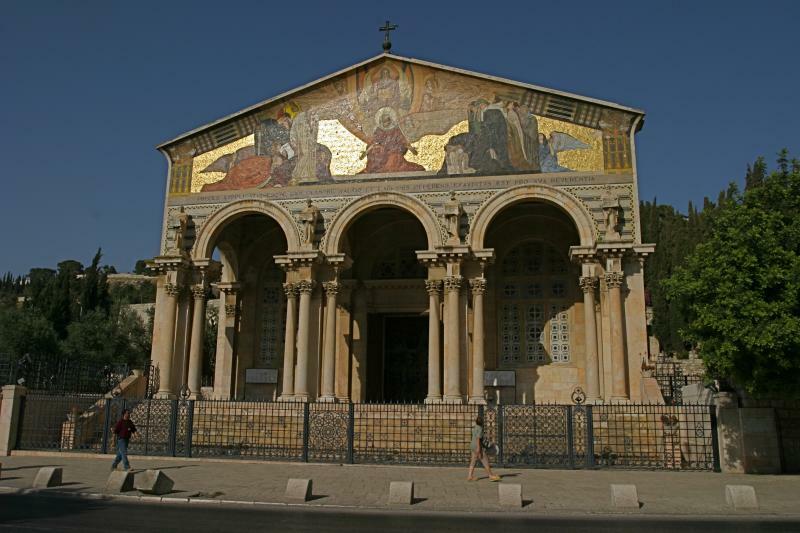 The richly-coloured triangular mosaic at the top of the façade makes it a Jerusalem landmark. The Gospels of Matthew, Mark and Luke tell that Jesus and his disciples went to the Mount of Olives after the Last Supper. He left eight of the disciples together in one place and withdrew further with Peter, James and John. He asked them — the three who had witnessed his Transfiguration — to stay awake with him while he prayed. Jesus “threw himself on the ground” (Matthew 26:39) and in his anguish “his sweat became like great drops of blood falling down on the ground” (Luke 22:44). But the three disciples, all of them fishermen who were used to working through the night, could not stay awake “because of grief” (Luke 22:45). Then a group from the chief priests and elders arrived to arrest Jesus. They were led by Judas, who betrayed his Master with a kiss. An atmosphere of sorrowful reverence pervades the Church of All Nations. The architect, Antonio Barluzzi, evoked the night-time of the Agony by leaving the interior in semi-darkness, relieved only by subdued natural light filtered through violet-blue alabaster windows. The sombre blue of a star-studded night sky is recreated in the ceiling domes, the stars being surrounded by olive branches reminiscent of the Gethsemane garden. 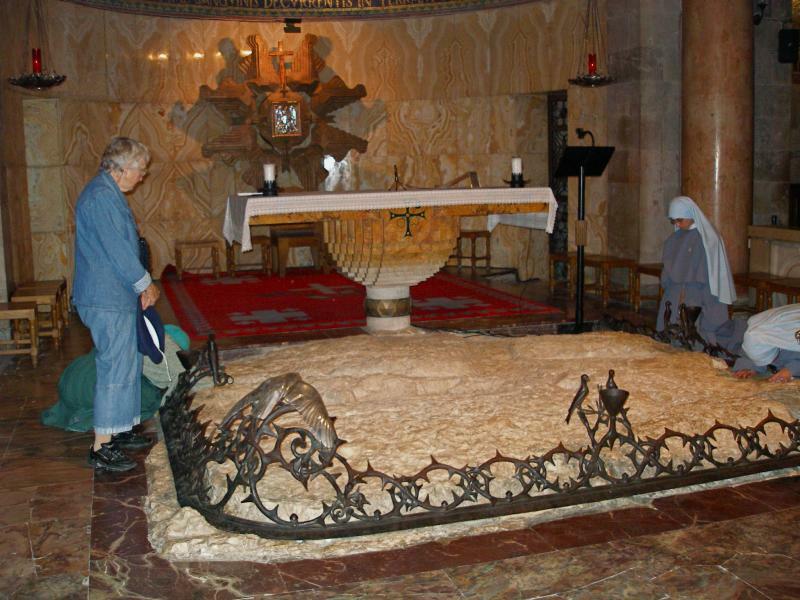 In front of the high altar is a flat outcrop of rock, which a long Christian tradition identifies as the Rock of Agony where Jesus prayed. There is a large mosaic in each of the three apses. From left to right, they represent The Kiss of Judas, Christ in Agony being Consoled by an Angel, and The Arrest of Jesus. The basilica is called the Church of All Nations because many countries contributed to the cost of construction. National symbols of 12 donors — Argentina, Belgium, Brazil, Canada, Chile, England, France, Germany, Italy, Mexico, Spain and the United States of America — are inside the ceiling domes. The mosaics in the apses were donated by Hungary, Ireland and Poland. The wrought-iron wreath around the Rock of Agony was given by Australia. The wreath is in the form of a crown of thorns with olive branches. A pair of thorn birds in front of a Communion chalice symbolise souls who wish to share the cup of Christ’s Passion. Two silver doves are depicted as sacrificial victims caught in agony in the thorns. During construction, parts of the mosaic floor of the original Byzantine church were discovered. These were preserved under glass and may be seen in the floor of the south aisle. The architect then decided to copy this 4th-century mosaic design in the floor of the modern church, to suggest a spiritual continuity throughout the ages of faith. On the façade of the Church of All Nations, the triangular area over the great portal displays a much-photographed mosaic. Christ is depicted as the mediator between God and mankind, on whose behalf he gives his very heart which an angel is shown receiving into his hands. On Christ’s left, a throng of lowly people, in tears, look to him with confidence. On his right, a group of the powerful and wise acknowledge the shortcomings of their might and learning. On the summit of the façade stand two stags on either side of a cross. Below the mosaic, statues of the four Evangelists are separated by three arches. 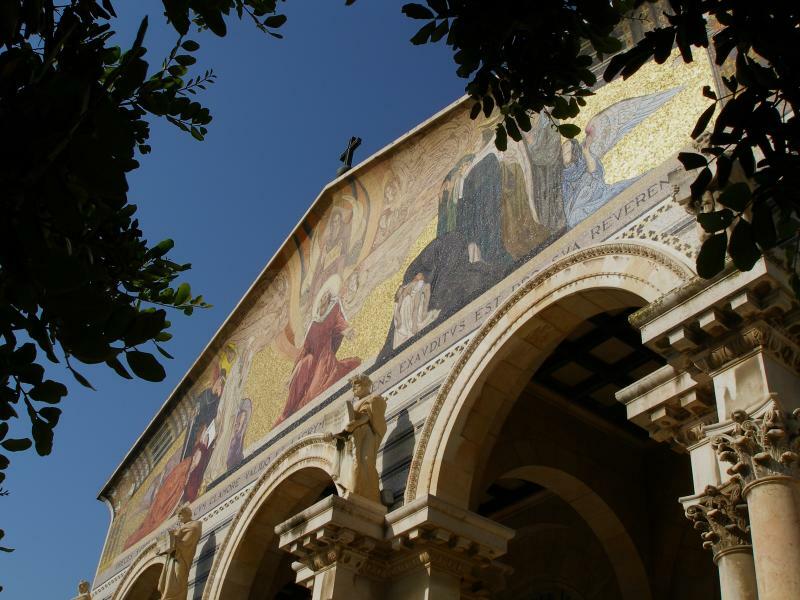 The garden of Gethsemane, near the foot of the Mount of Olives, is named in the New Testament as the place where Jesus went with his disciples to pray the night before he was crucified. The garden, about 1200 square metres in area, was well known to the disciples as it is close to the natural route from the Temple to the summit of the Mount of Olives and the ridge leading to Bethany. The name in Hebrew means “oil press”. Oil is still pressed from the fruit of eight ancient and gnarled olive trees that give the garden a timeless character. Beside the garden is the Church of All Nations, built over the rock on which Jesus is believed to have prayed in agony before he was betrayed by Judas Iscariot and arrested. 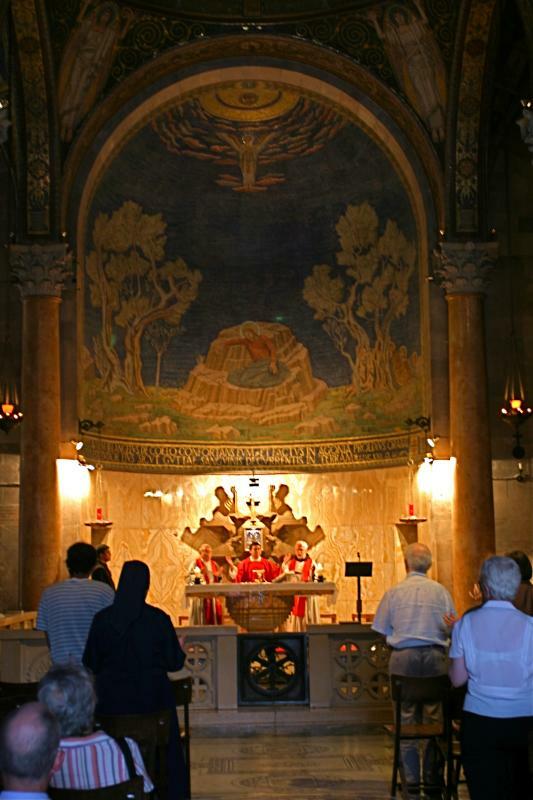 About 100 metres north of the church is the Grotto of Gethsemane, where Jesus and his disciples often camped at night. In this natural grotto, it is believed, the disciples slept while Jesus prayed. Near the grotto is the Tomb of Mary, where a Christian tradition holds that the Mother of Jesus was buried after she “fell asleep” in death. How old are the trees? In the garden of Gethsemane, behind a fence of iron tracery with Byzantine motifs, stand the gnarled trunks of eight hoary olive trees. They create a spiritual atmosphere for visitors to the garden of Gethsemane, although the flower beds and paths around them introduce an artificial element. The trees also generate conjecture about their age. Were they silent witnesses to the Agony of Jesus the night before he died? Israel has many ancient olive trees. Two in the town of Arraba and five in Deir Hanna have been determined to be over 3000 years old. The present Gethsemane trees, however, were not standing at the time of Christ. The historian Flavius Josephus reports that all the trees around Jerusalem were cut down by the Romans for their siege equipment before they captured the city in AD 70. Research reported in 2012 showed that three of the eight ancient trees (the only ones on which it was technically possible to carry out the study) dated from the middle of the 12th century, and all eight originated as cuttings from a single parent tree. 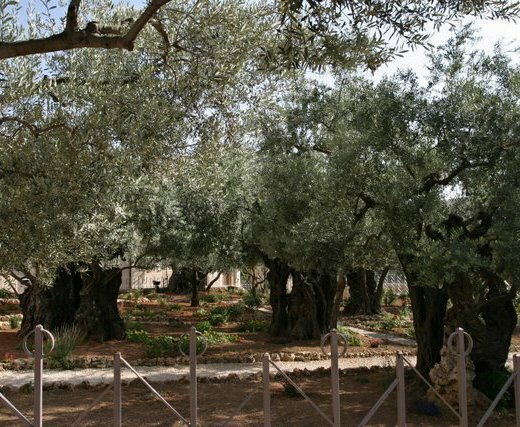 The Gethsemane olives are possibly descendants of one that was in the garden at the time of Christ. This is because when an olive tree is cut down, shoots will come back from the roots to create a new tree. In 1982 the University of California carried out radiocarbon-dating tests on some root material from Gethsemane. The results indicated that some of the wood could be dated at 2300 years old. 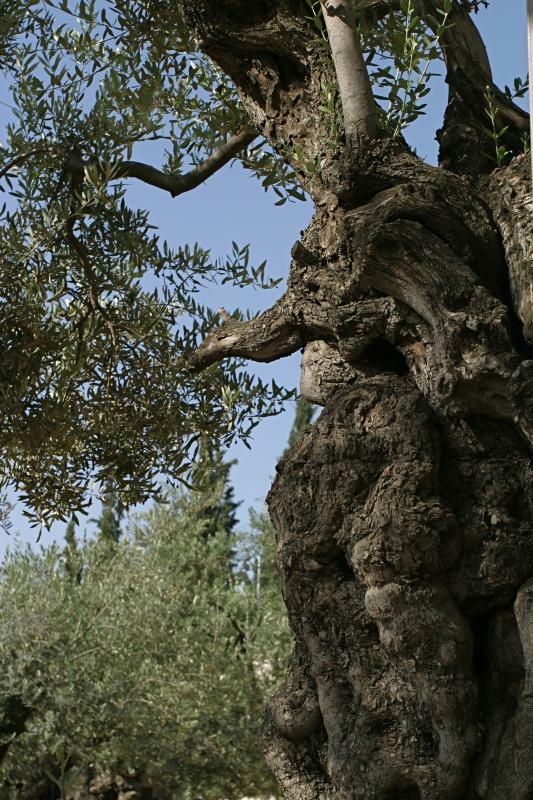 What happens to the fruit from the Gethsemane olive trees? When it is harvested each year, the oil is pressed for Gethsemane’s sanctuary lamps and the pits are used to make rosary beads, given by the Franciscan Custos of the Holy Land to notable pilgrims. Access to the Grotto of Gethsemane is along a narrow walled passageway leading to the right from the open courtyard in front of the Tomb of Mary. 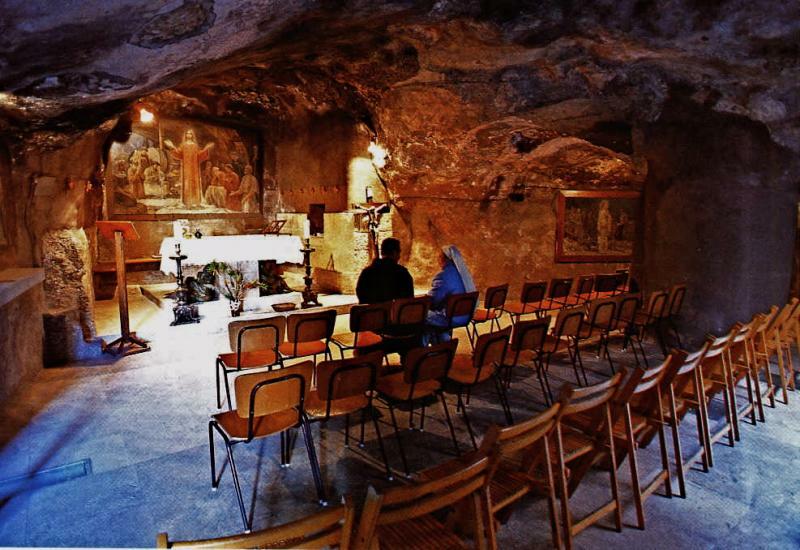 The natural grotto, about 190 square metres in area, is basically unchanged from the time of Jesus. It is believed to be where the disciples slept while Jesus prayed, and where Jesus was betrayed by Judas and arrested. It may also be the location of Jesus’ night-time meeting with Nicodemus (John 3:1-21). Over the main altar is a representation of Jesus Praying among the Apostles, while the paintings over the side altars depict the Assumption of the Virgin and the Kiss of Judas. On a more mundane level, bronze figures beneath the main altar depict two of the sleeping disciples. The grotto is also known as the Cave of the Olive Press. To the right of the right-hand altar is a hole in the wall. It is just at the right height to hold one end of a wooden beam which, when weighted at the other end, pressed crushed olives piled in loosely woven baskets. In the 4th century the grotto became a chapel. The floor was paved with white mosaic through which graves were subsequently dug. More than 40 graves, mainly from the 5th to 8th centuries, have been discovered.